Durham Nephrology is now offering individual CKD 4 educational classes for patients. During the classes, patients will learn about their diagnosis of stage 4 chronic kidney disease, how to protect their health and future treatment options. Additionally, these classes allow sufficient time for patients to ask questions and receive personal attention to their concerns. There are five stages of kidney damage, with Stage 1 being very mild to Stage 5 being complete kidney failure. 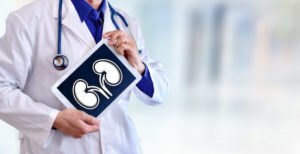 Those with chronic kidney disease, stage 4 (or CKD 4), have kidneys that are moderately to severely damaged and do not function as well as they should. While you may not display obvious symptoms in the early stages of kidney disease, by stage 4 symptoms become much more common and prevalent. The most common symptoms of this stage include swelling in the hands and feet, back pain and changes in the frequency of urination–either more or less than normal. Other symptoms may include fatigue, difficulty sleeping, nausea, vomiting, loss of appetite, bad breath and a metallic taste in the mouth. As a result of waste building up in your body, other health complications are more likely to develop such as high blood pressure, anemia and bone disease. It is important to take a CKD 4 diagnosis seriously, as it is the last stage of kidney disease before kidney failure. Patients in this stage will likely require dialysis or a kidney transplant in the near future. If you would like more information or to schedule an individual CKD4 educational class, call Durham Nephrology at (919) 477-3005 or complete our appointment request form.